The music and perhaps also the recording technique, cause the sound to be utterly woven together and this promotes listening to the whole picture rather than to the details, which I find attractive. We hear how the group, tightly together, works itself forward. Campbell's impressions and influences come from different cultures and parts of the world, but this music is incontrovertibly modern American jazz. This album features a sparse but very self-sufficient trio. Trumpeter Roy Campbell extends the tradition of Don Cherry and Bobby Bradford while borrowing now and then from Freddie Hubbard. Bassist William Parker and drummer Reggie Nicholson are equal partners on the six lengthy group originals (four by Campbell, two by Parker) and they inspire the leader to come up with consistently inventive playing. On "Chant for Don Cherry" (which has a Spanish rhythm stated by Parker), Campbell certainly brings back Cherry's spirit. 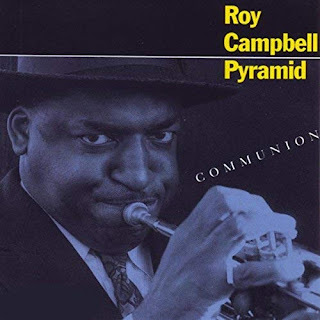 Since the pieces are long (the nine-minute "Communion" is the briefest), there are some meandering moments but in general the interplay between the three musicians holds one's interest; Parker's bowed bass on "Air Pockets" really pushes Campbell.